Huntington Beach, is closing on June 4th, 2006. 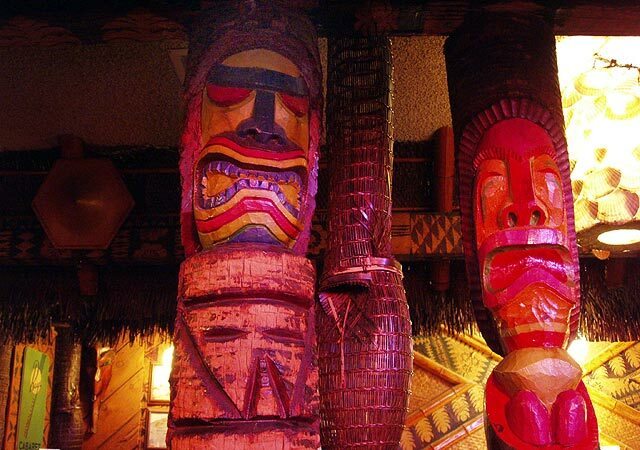 I find this disheartening; of the four tiki bars and/or restaurants I visited on my trip to LA, last August, two are not long for this world. 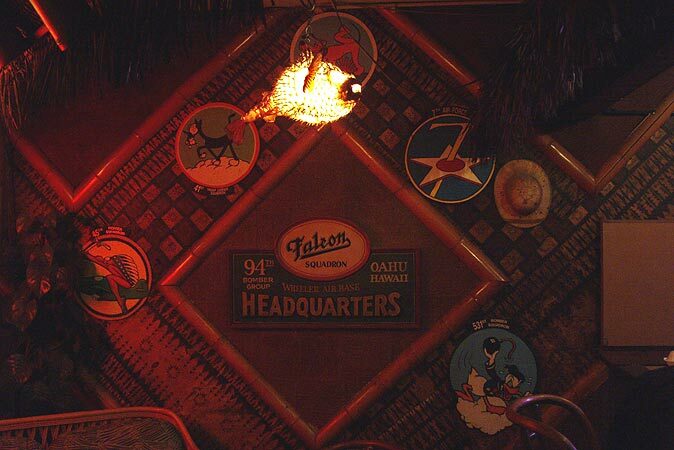 The other endangered establishment is Trader Vic's. 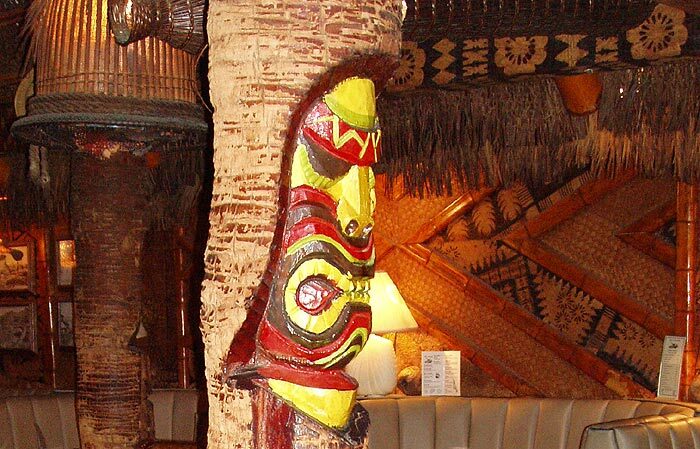 Like many classic tiki-themed establishments, Sam's utilizes the Polynesian-inspired A-frame in it's architecture. 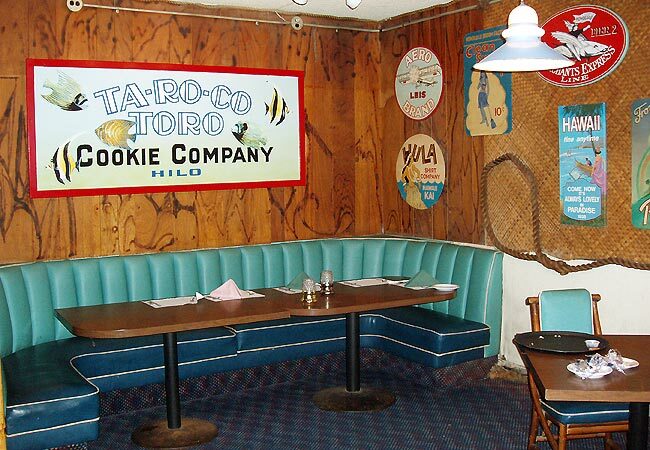 According to Sam's website, the business dates back to 1923 and has been at the current location since 1960. A manager told me that a fire damaged the original structure and that it was rebuilt, to his recollection, in the early 1960s. 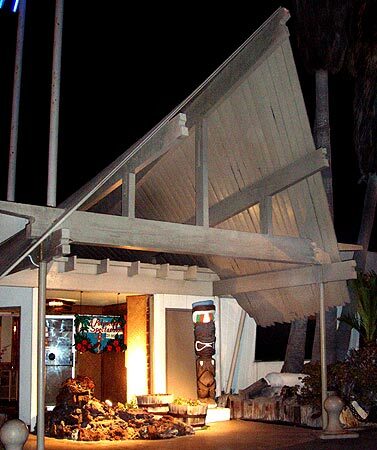 He also said that even before this rebuild, the restaurant was always tiki, but I doubt this. 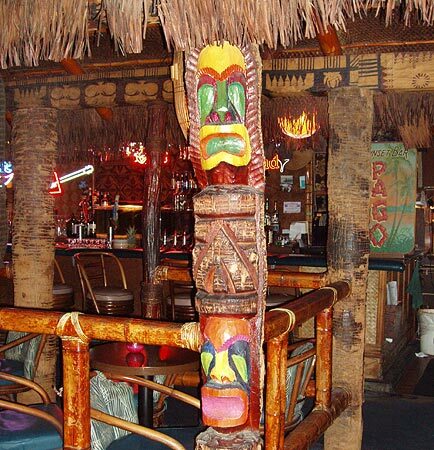 Under the A-frame, you can see more of the typical elements with which a tiki place attempts to usher the customer from the outside world to it's own atmosphere. 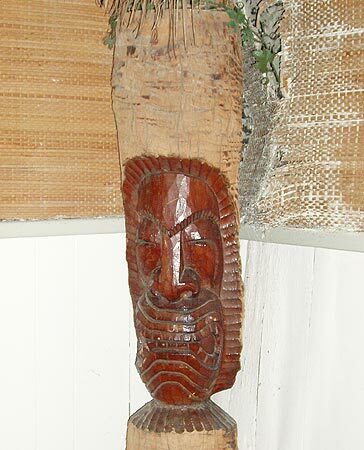 This is the first of many wood tikis the visitor sees. 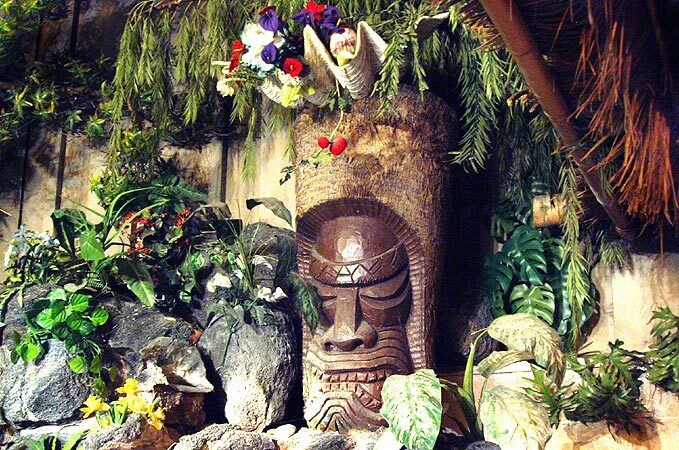 Sam's is noted for its Polynesian show. I didn't see it, but I understand from aficionados of such things that it's pretty good. 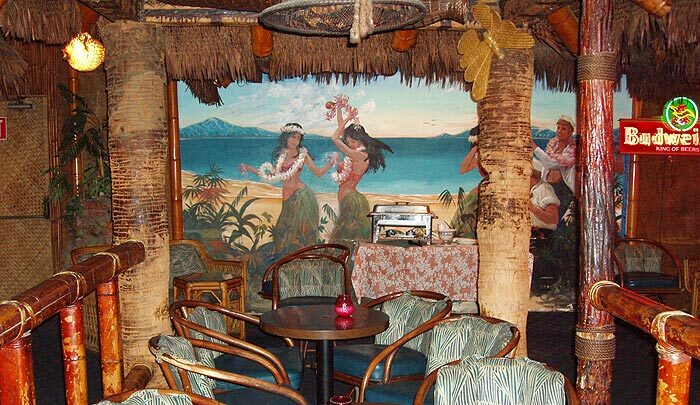 This fountain tableau is displayed along the back wall of the main dining area. 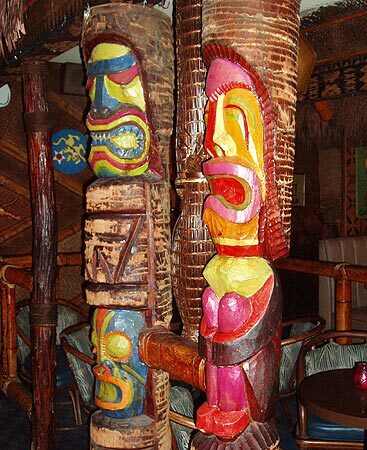 There are over a dozen unpainted wood tikis scattered about Sam's. Here are a few. 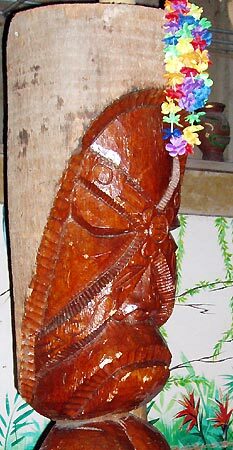 Some of them look to me like the work of Philippine carver Milan Guanko, who also carved many of the tikis seen at Kon Tiki in Tucson. I have no confirmation of this, however, as I couldn't find anyone at the restaurant who knew anything about the origins of the statues. 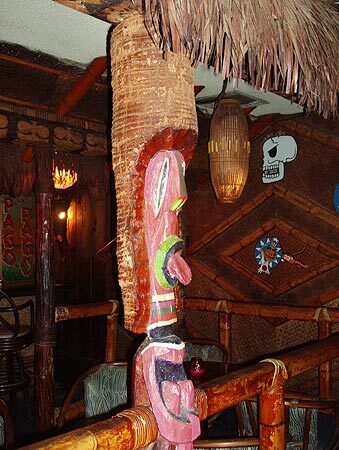 I've no idea why this tiki was wearing Christmas decorations in August of 2005. 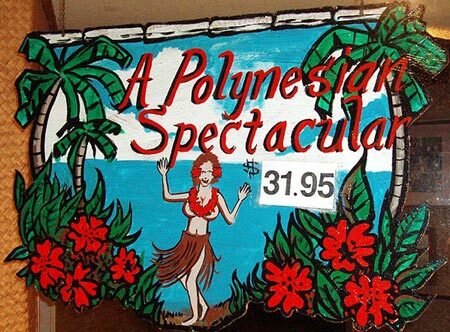 Signage reinforces the Polynesian (usually Hawaiian) theme of the place. 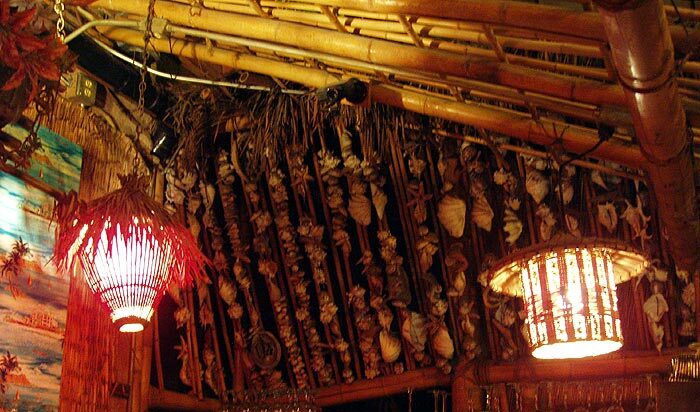 Although we loved the decor, the food was mediocre. The lobster wasn't bad, really; it just wasn't as good as one could get at a Midwestern Red Lobster and, as a tourist to the Pacific coast, I expected better. The service wasn't stellar either. We were astounded that we were practically the only customers in the place at about 8PM on a Thursday night. That being said, Sam's does have fans who tout the quality of their crab. I should really be thankful about the lackluster quality of the food; had it been great, I'd have had trouble tearing myself away to take pictures. And, in walking around to hunt down someone to refill our drinks, I did quite a bit of exploring. The bar in Sam's Seafood was the most interesting part, to me. 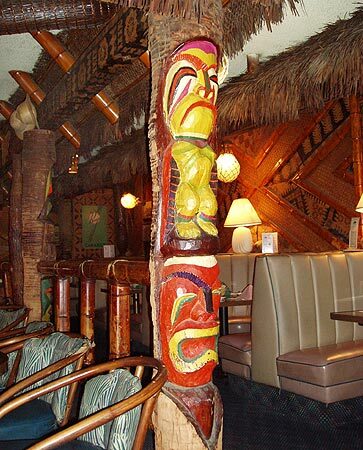 Although garishly colored, the sheer overpowering saturation of tiki poles, complemented by tapa cloth wallpaper and properly themed hanging lights, overcame any flaws in the decor. 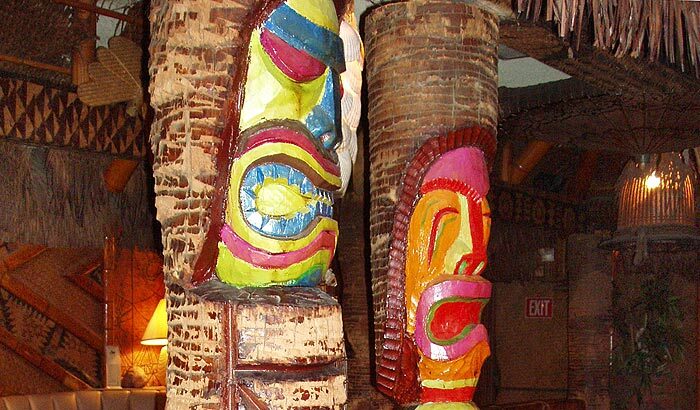 According to a manager, the tikis were last painted about 20 years ago. I don't remember intentionally shooting this picture with a tilt. 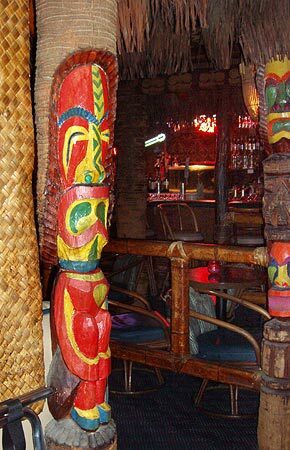 In any case, I love using the existing light in tiki bars. 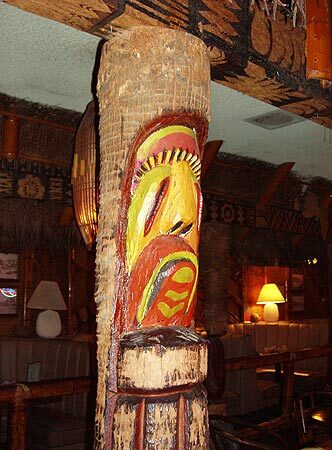 This is the same tiki, shot with flash. 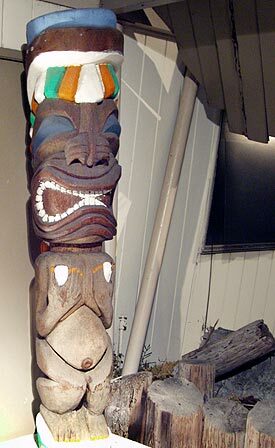 Here's a pair of tiki poles in ambient light. The flash shows more detail, if less atmosphere. 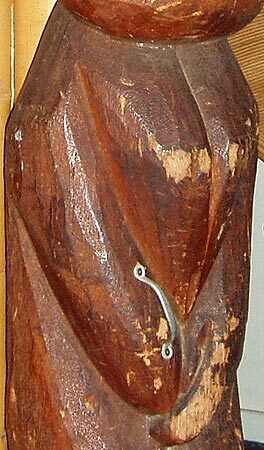 the colors reveal something odd about the lower face in the left-hand pole. 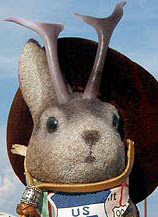 Does anyone else think of a Mexican wrestler? 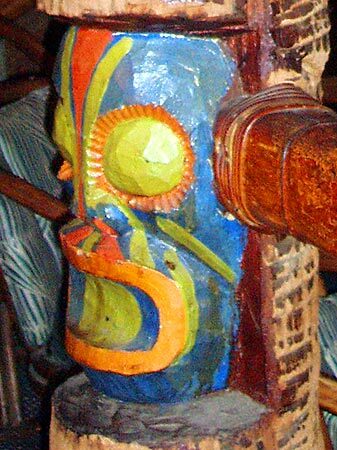 Brightly colored paint is not the preferred finish of most tikiphiles. Finished wood generally rates more highly. ...is that supposed to be a necktie? One of the bar's very atmospheric corners. 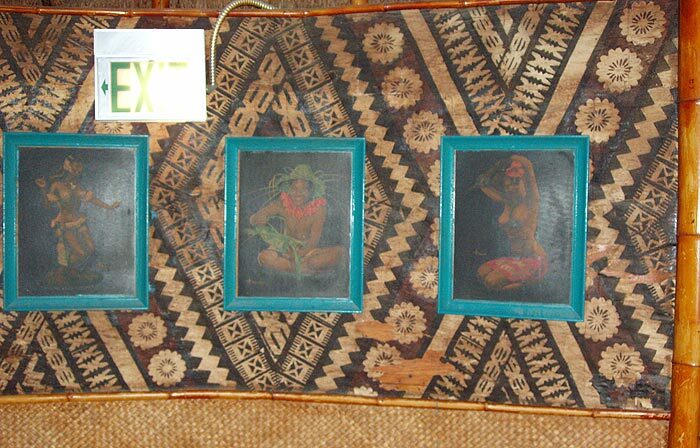 Black velvet paintings of idealized Polynesian life are a traditional accoutrement to tiki bars. There are people who collect these and study the lives of the artists in detail. 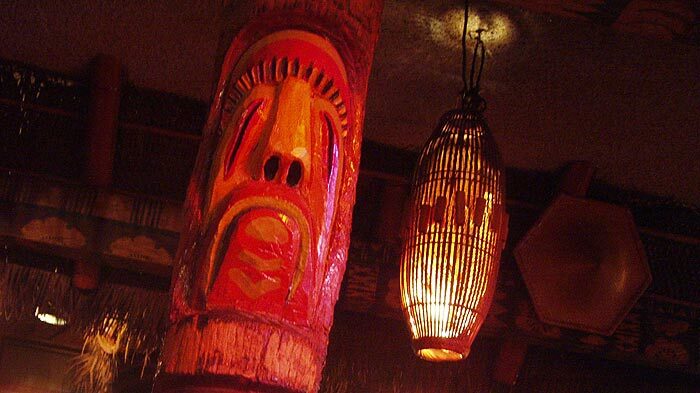 Lighting in tiki bars may be minimally functional as far letting you see your surroundings, but its real purpose is ambiance. I don't even know if there are light bulbs in the long fish traps. 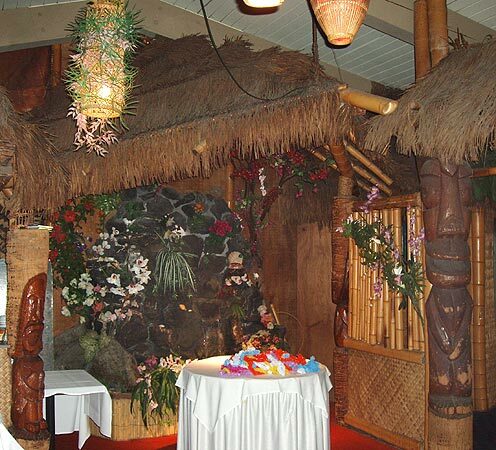 I think it probable that most of the decorations and lights shown here were made by Oceanic Arts, a long-time supplier of Polynesian decor from Whittier, CA. We went there too and took a zillion pictures...more on that when I get a the chance to deal with them. 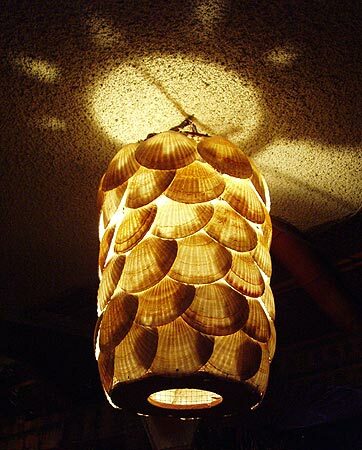 Scallop shell lamps are a staple of tiki bar lighting and are still sold by Oceanic Arts. They were also distributed by defuct suppliers like Orchids of Hawaii and Benson's Sea and Jungle. I'm not crazy about the Budweiser sign. 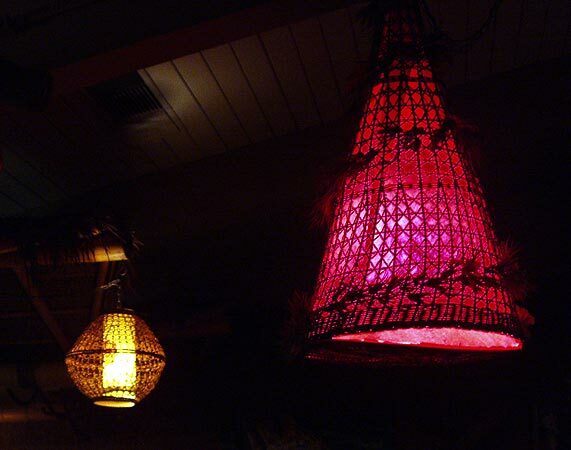 An common form of tiki bar lighting is the glass fishing float, seen hanging to the left of center. 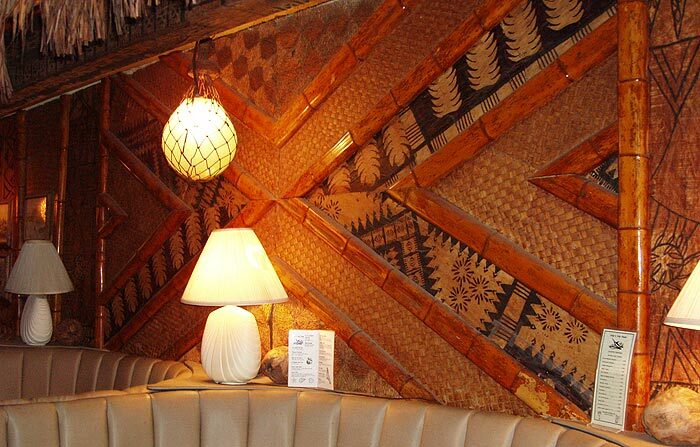 The table lamps and the vinyl upholstery seem incongruous with the tapa cloth walls, but, hey, it's not like you can just up and go down the street to a place that does it better. Elsewhere in Sam's (and it's a big place with several large rooms) there is much great decor. 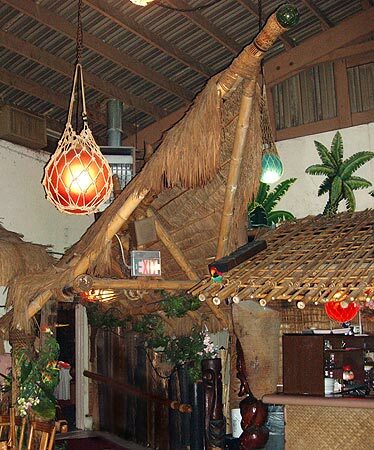 Here are more cool lamps, an A-frame, a waterfall, lots of bamboo and two tikis - all within a few cubic yards. ...which is afflicted with the indignity of having a handle affixed. 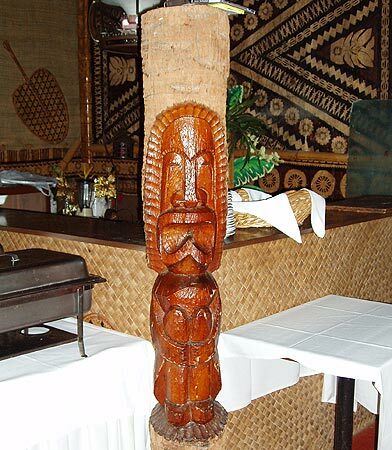 The restaurant contains a few of these unpainted poles. 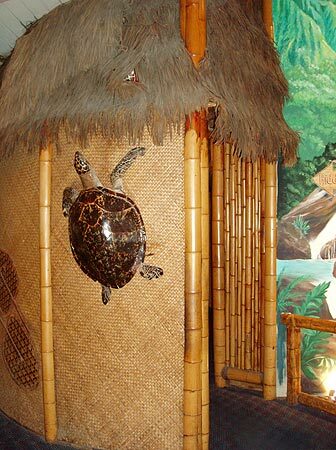 Taxidermed sea turtles are also traditional tiki decor. I have a personal affection for living turtles so I have a mixed reaction when I see one of these...of course, if I found one cheap I'd fly my hypocracy like a flag and fasten it to the wall. 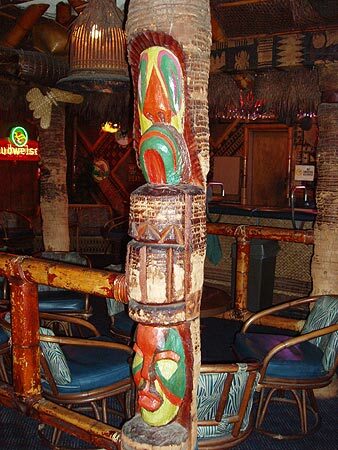 More classic tiki bar lighting...notice the colored light bulbs. 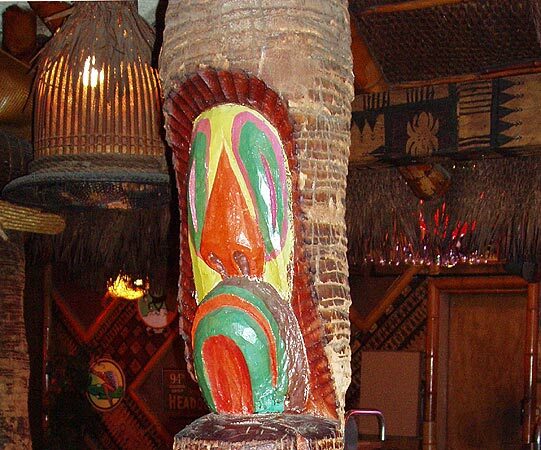 This is the first tiki I've seen that has the "X" pattern over the face, although the "X-eyed" tiki mugs are common. I don't know if there is any cultural authenticity to this pattern. 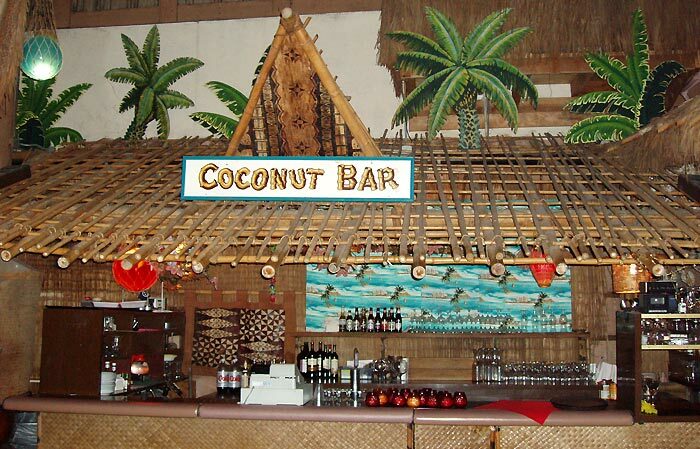 The Coconut Bar resides in one of the large banquet rooms. Sam's makes good use of partial A-fames jutting out into rooms, creating an impression of buildings beyond. Look at the walls. Look at the ceiling. They are dull and industrial when seen in the light of a flash unit, but virtually hidden in the ambiant light of the room. Unfortunately, time was pressing and I couldn't drag in a tripod for the long exposures needed to convey this in the larger rooms. This poor guy looks like he's suffered a few impacts. He's sort of a moai (Easter Island head). 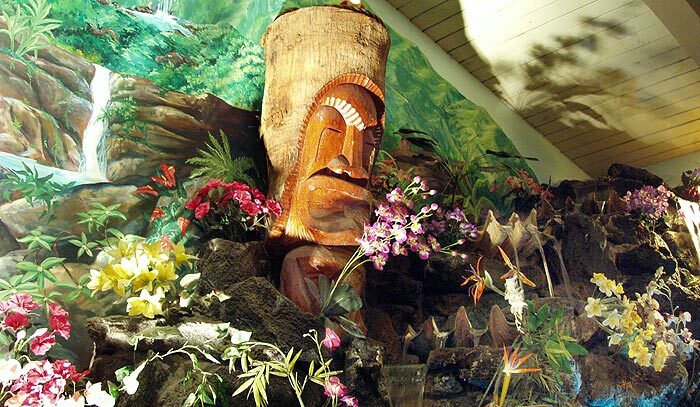 One of the better-carved and more authentic-looking Hawaiian tikis is utilized in a waterfall fountain. Note the slight lime encrustation. 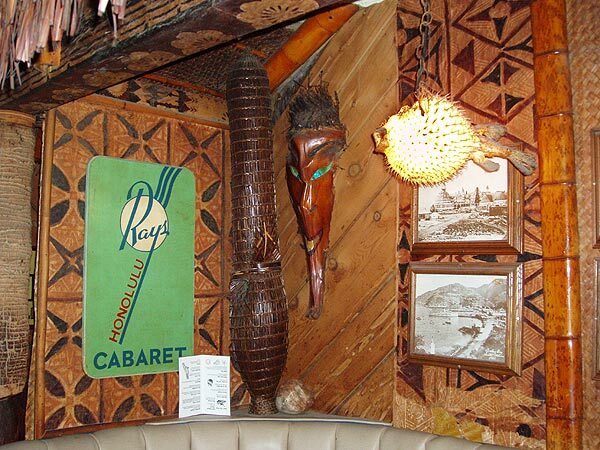 The big clam shell atop the tiki is another bit of classic decor. 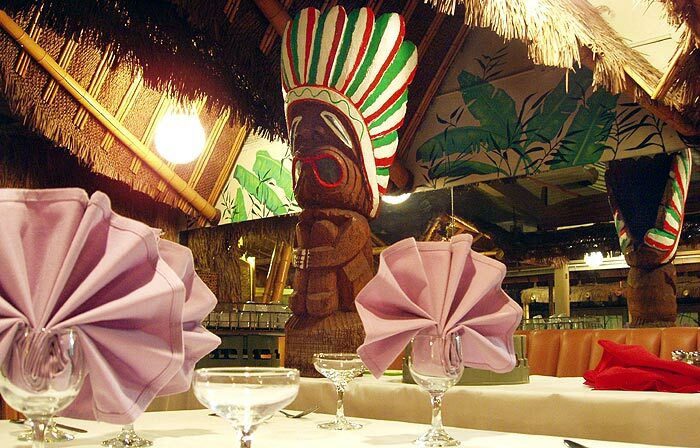 A large room within Sam's is set for a banquet, overseen by tiki in a head dress under an implied A-frame. 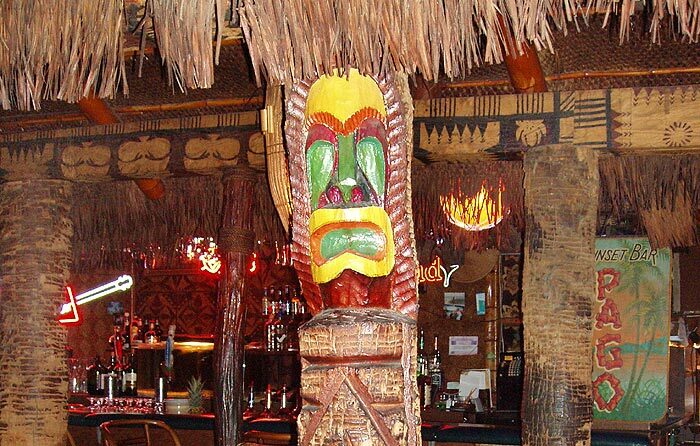 One of the societal factors driving the mid-20th century tiki bar explosion was the return of soldiers from the WWII Pacific theater. I'm no expert on WWII emblems, but I bet thats what the the discs on the wall represent. And notice the puffer fish? 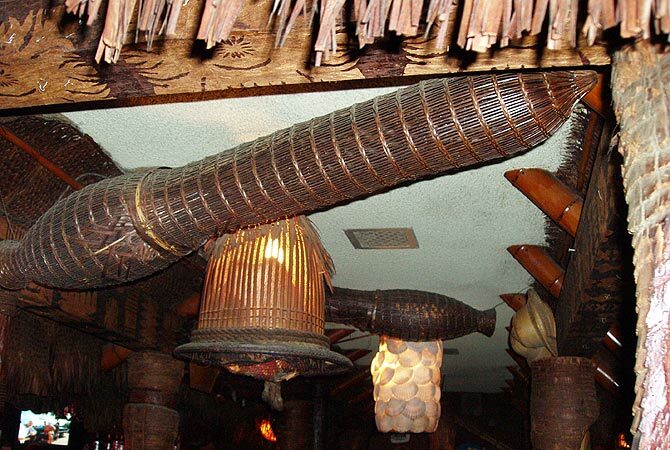 These are yet another example of classic tiki lighting. 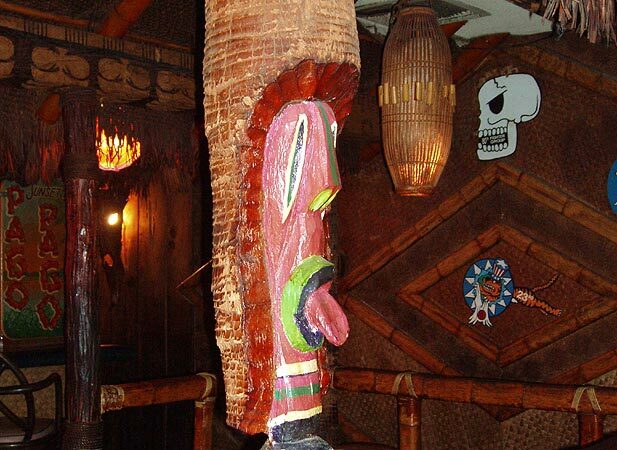 Tikicentral.com has several threads about Sam's; this one contains some history and food and drink reviews. This post by tikicentral member SugarCaddyDaddy, in a similar thread, contains nice pictures of the floor show. 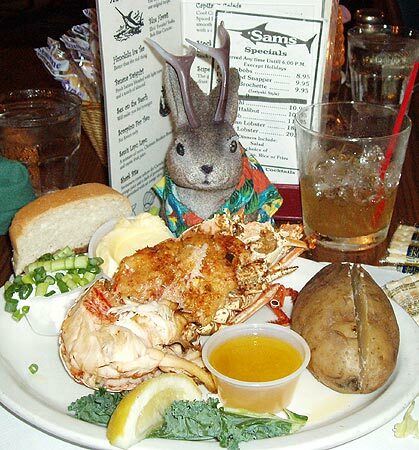 Sam's is well-loved, flaws and all, by tikiphiles and there are at least two farewell events in the planning stages right now, Sam's Seafood Last Hurrah Crab Crawl 5/22 and Big Sam's Goodbye Party. One rumour is that condos are to be built on the soon-to-be-former site of Sam's Seafood; A manager, who wished not to be named, told me recently that the new owners planned to do nothing to the place for a couple years. 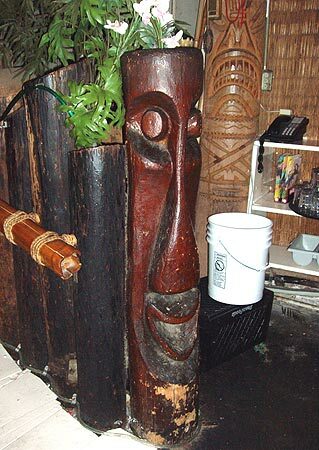 In any event, to the idea of Sam's closing, I think this tiki from the bar properly expresses my feelings. 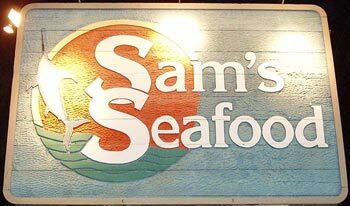 UPDATE: As of December, 2006, there was a strong rumor that Sam's is re-opening or has possibly already re-opened on a limited basis. If you are a reader with more information on this, especially if you are the owner, please comment here. Thanks so much for the photos. I was lucky enough to attend the big final party! 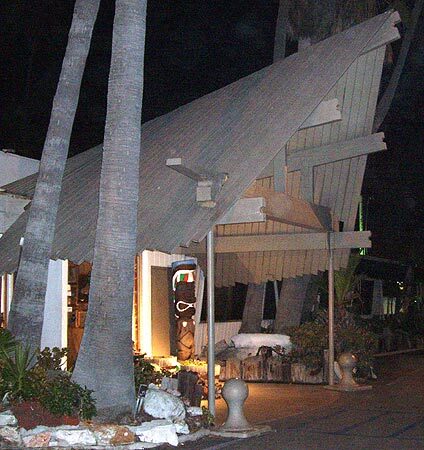 RIP Sam's. Do you know what they are going to do with all the decor????? My husband danced there for years.....sad. I hear they may demo it? 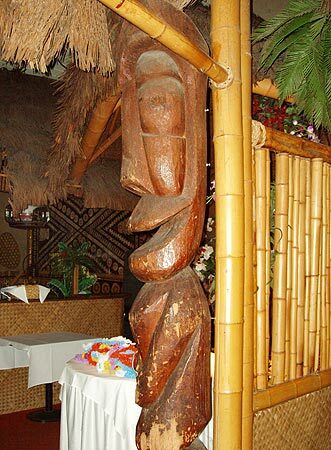 I don't know of any plans for the decor or the building; I imagine many tikiphiles have their eyes on it. Your best bet is to make contact with the owners, whoever they may be at this time. You might also want to go to tikicentral.com and use their search function to find threads about Sam's. In the meantime, if you or your husband have any anecdotes or observations about Sam's history, decor, etc. to share with our readers, please do. When did he dance there and what sort of changes has he seen in the place over thr years? 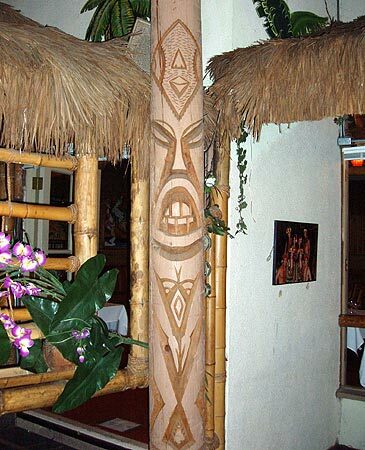 Did he ever hear who carved any of the tikis? Aloha! I drive by Sams twice everyday on my way to and from work. As of today there is a new sign ( not the neon is still there) and a big banner that says "Opening Soon"
Just wanted everyone to know that Sam's has reopened!!! I'd only been to Sam's once before it closed (when I was like 12) so I don't remember much of anything about it. 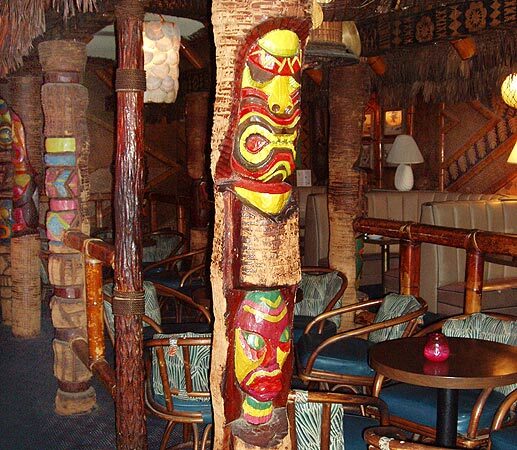 The idea of the restaurant has remained the same with some changes. From what older patrons tell me, the place has been cleaned up quite a bit. 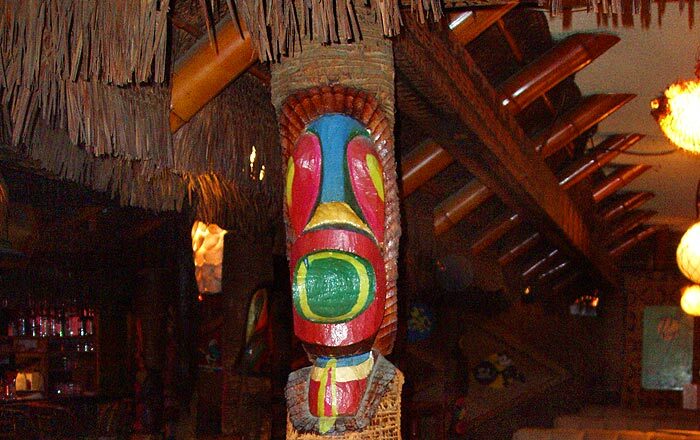 The tiki feel is still there but not nearly as much as the above pictures show you. The menu is delicious!!! However, don't go expecting a steak and lobster dinner special...they don't have it. (not yet anyways). Oh yeah...and I work there. Come and enjoy and embrace the changes. 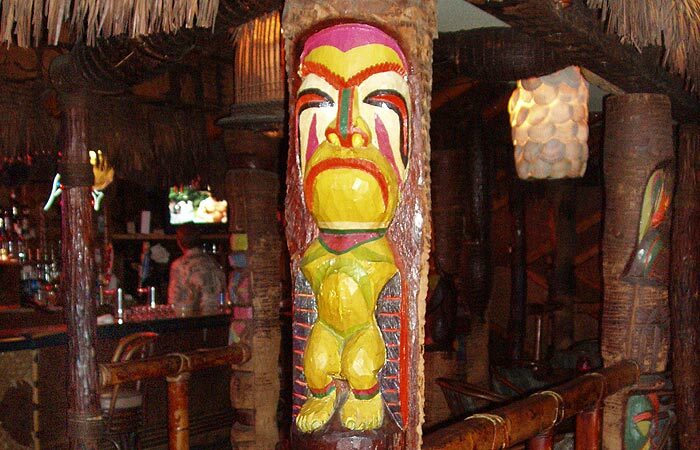 A lot of the tiki feel is gone at the new place...They play RAP music, blaring TV's in the bar, OVERPRICED food, OVERPRICED foo foo drinks...some tikis are left but this place has lost it's former mystique. The bartender chicks are hot though. Sam's is alive and well! Brand new owners since January of 2008. They have been listening! Brighter dining room, LOWER PRICES, Larger Portions, NO RAP MUSIC - CLassic Rock but not too loud you can't talk to your friends and More choices on the menu! 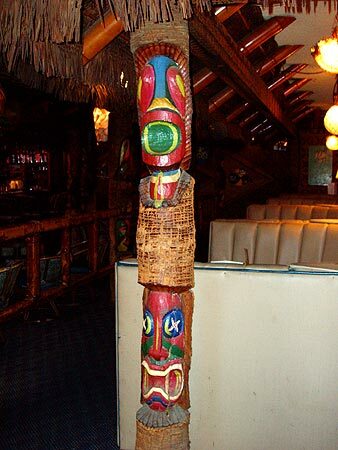 They will be changing the name to Kona by the end of the month but intend to keep Tiki alive and even add to it! Farewell Sam, Aloha Kona!